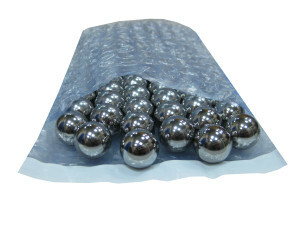 VCI Bubble Bags provide the ideal way to protect high precision metal finishes from marring, scratching, and corrosion while in transit or storage. bags are constructed in two layer of extruded vci film for maximum protection. The slow release vapor action of VCI2000 film protects the exterior as well as hard-to-reach interior surfaces of metal parts. 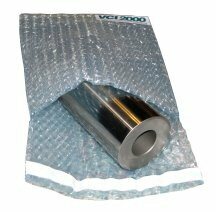 VCI2000 film is self-healing and will provide 24 months of corrosion protection, making it ideal for storage and overseas shipments. Electronics, Bearings, Precision Parts & Automotive. Available in Blue and Clear. Also available in anti-static. Carbon steels, stainless steels, copper, brass, aluminum, silver, galvanizedsteel, solder, silicone steel. VCI2000 Bubble Pouches with E-Z Seal Technology by Polyair have a 1/4” strip of adhesive on one edge. Lip-only pouches are without the self seal adhesive on the lip. Flush Bubble Pouches have no lip at the opening of the pouch.